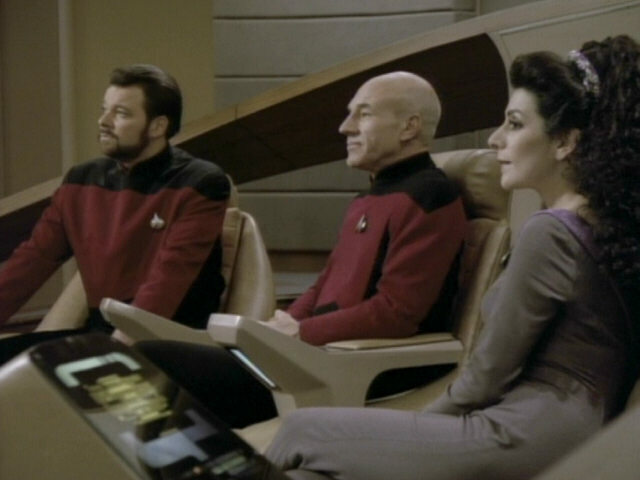 Ex Astris Scientia - Observations in TNG: "The Inner Light"
Observations in TNG: "The Inner Light"
Here are some observations about sets, props and visual effects in TNG: "The Inner Light" without a specific theme, and a comparison of the original TV release (TNG) with the remastered episode (TNG-R). 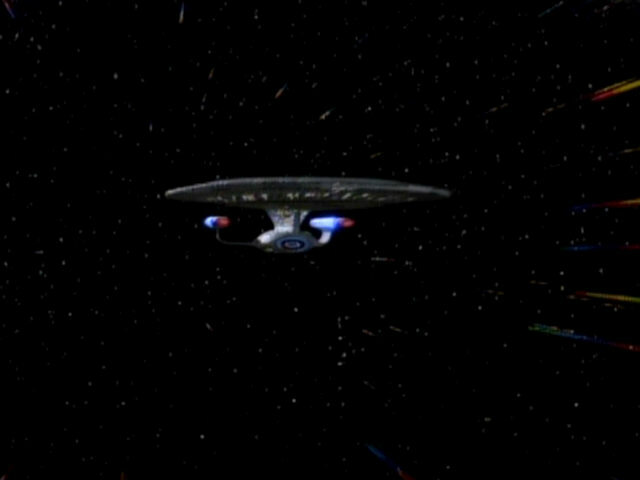 A flyby of the USS Enterprise-D.
Enterprise Flybys in TNG and TNG-R As "The Inner Light" was the first episode to be remastered that featured the missing flyby shot, a very early CG model of the USS Enterprise-D, not seen again in any later remastered episode, can be seen here. The Kataan probe can be seen on the main viewscreen of the USS Enterprise-D. In the second screenshot, the probe is seen emitting a low level nucleonic beam. 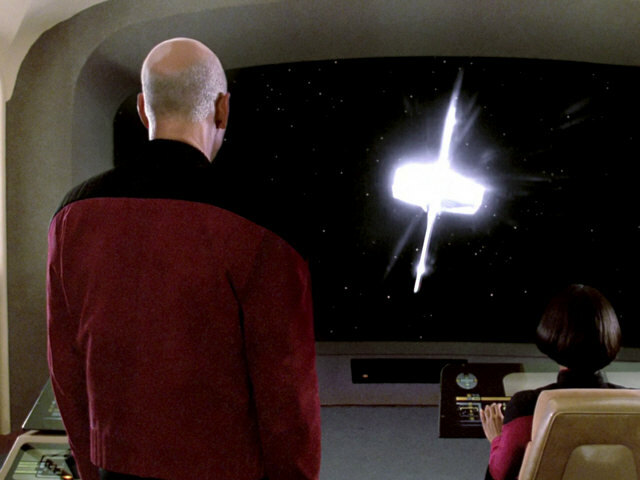 The light effect is practically identical in TNG-R.
Picard overlooking the village Ressik on Kataan. 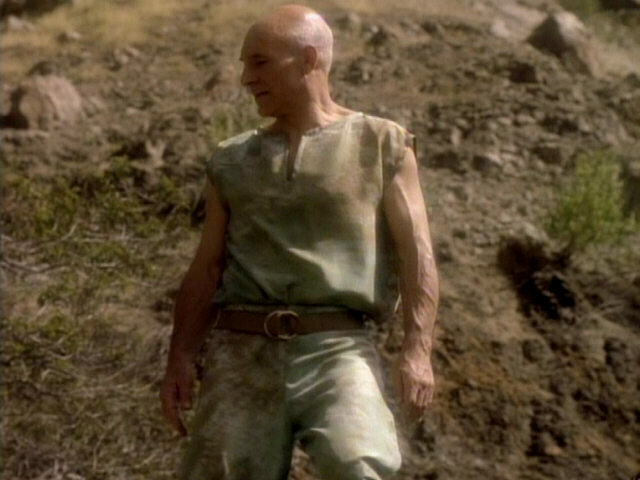 Footage of Patrick Stewart was filmed at Bronson Canyon, the village was added in post production. 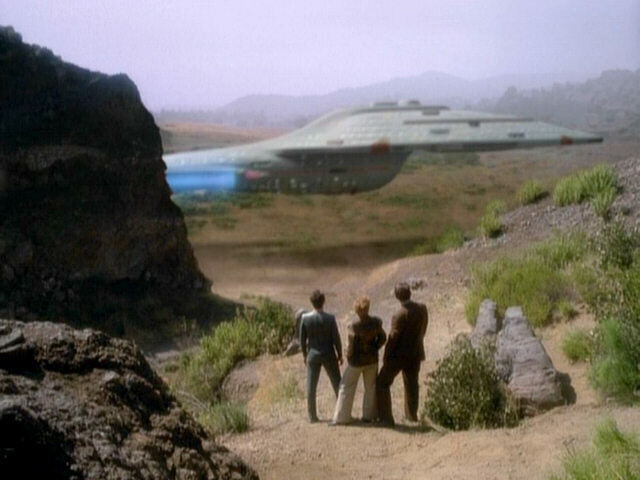 VOY: "The 37's" was also filmed at Bronson Canyon and features a very similar shot. 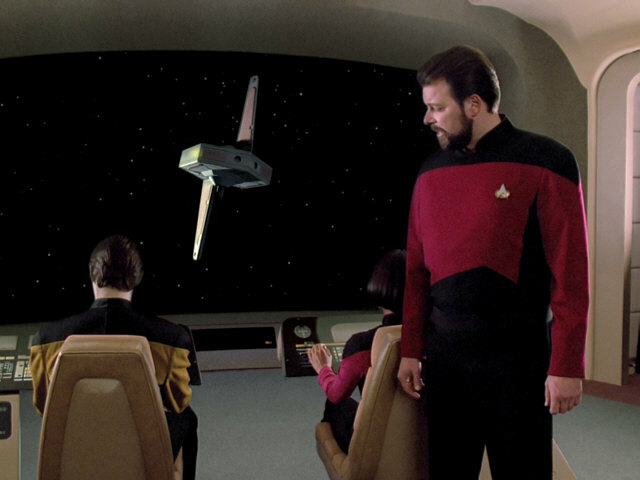 VOY: "The 37's" The matte painting was edited for TNG-R. 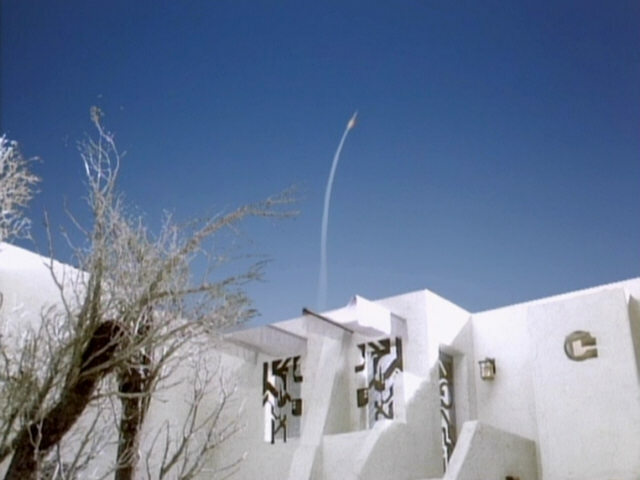 The town now appears to consist of fewer buildings. 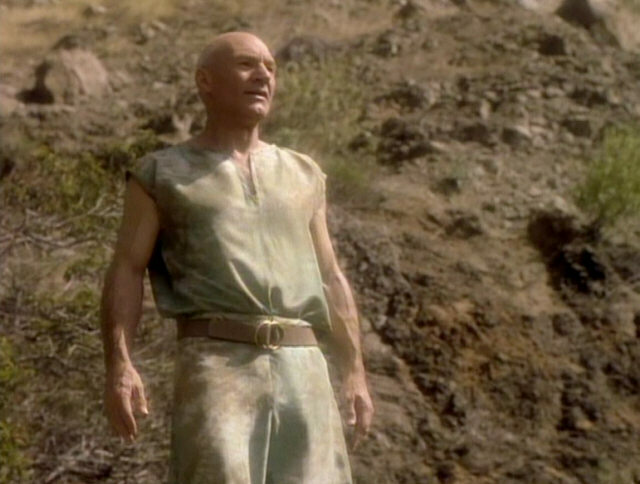 When Picard climbs up the hill overlooking the village, we can see nothing in his hands. 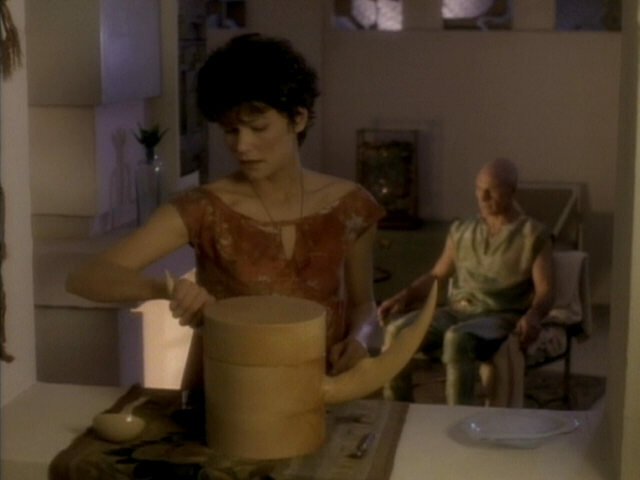 However, as he is looking at Ressik, he holds a hat in his left hand, of a kind he wears later in the episode (when he is considerably older). 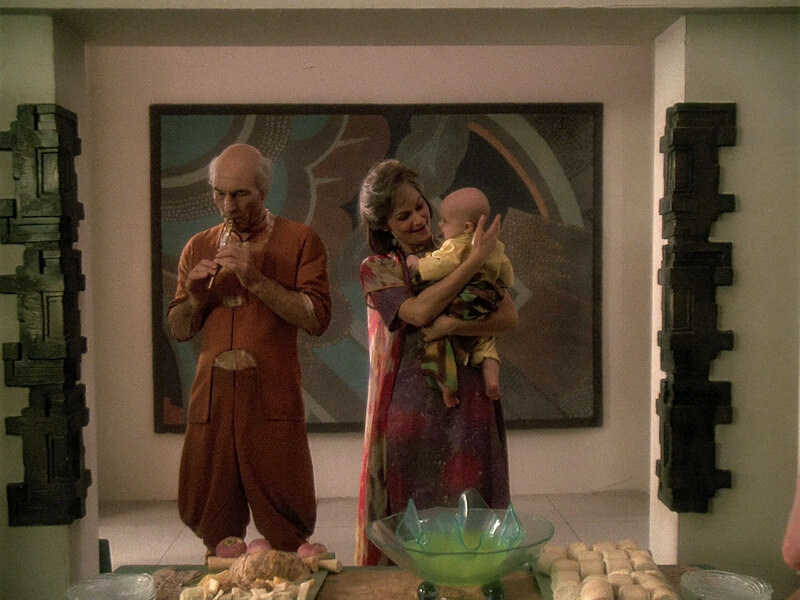 As he climbs down, he is holding nothing again. 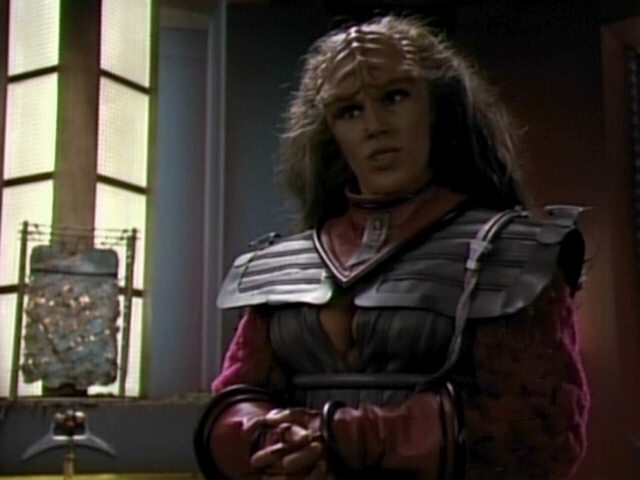 Ressikan drawers are very peculiar. 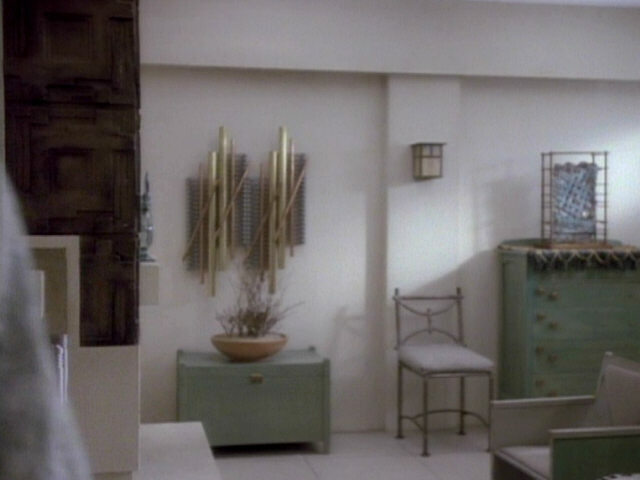 As can be seen, the knobs were moved from their normal locations at the center of the drawer (if one knob is present) or at both sides of the drawer (if two knobs are needed) and now are all located at the left side of the drawer. 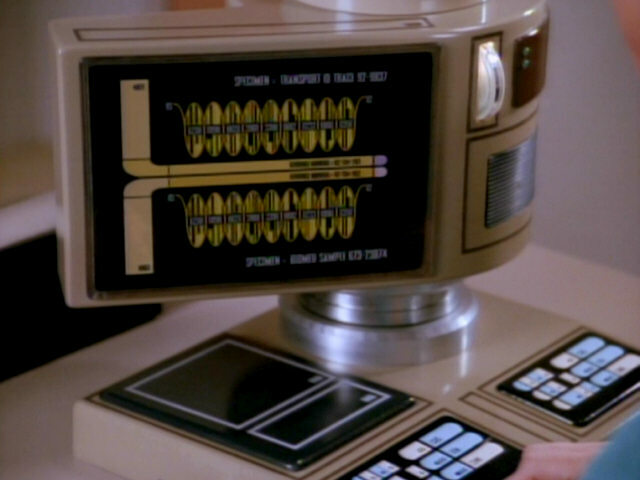 This all looks very alien and unique, but how is one supposed to open the drawers, especially the larger ones, when both knobs are located on the left? 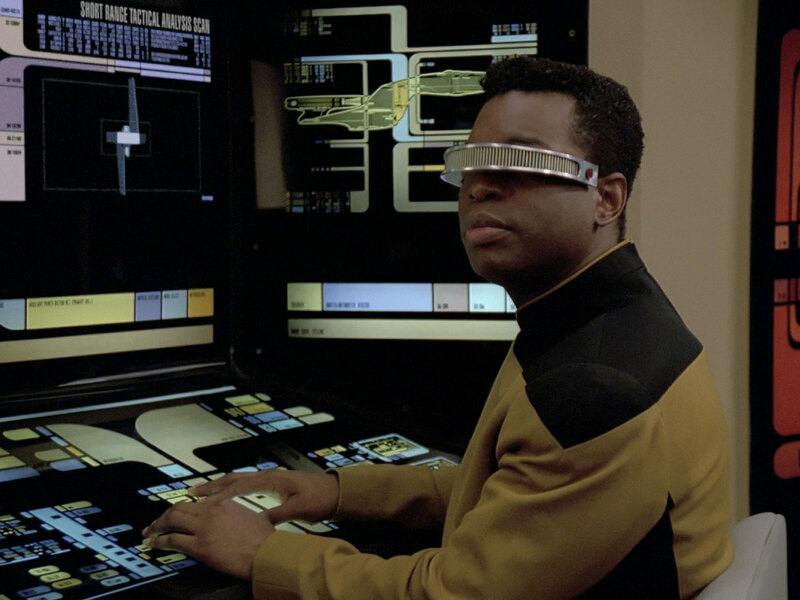 A closer look at the drawers in HD. 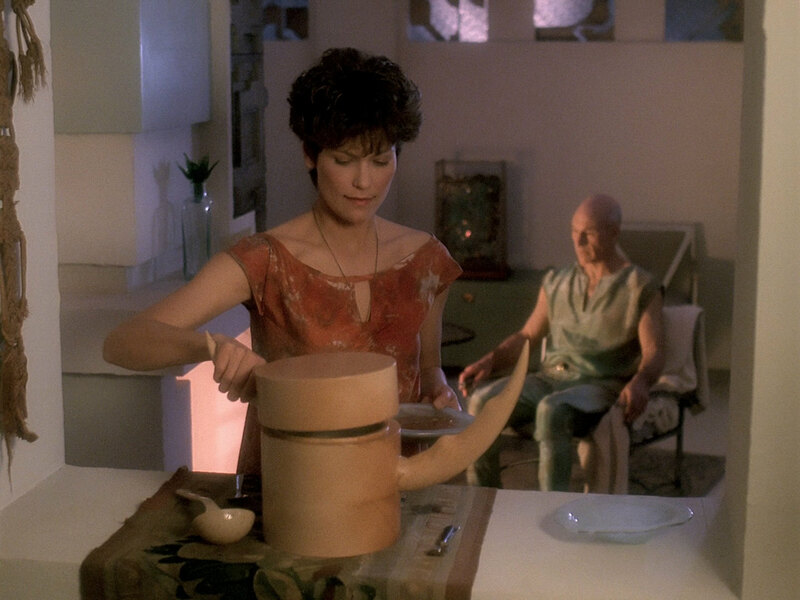 This large soup bowl is later seen again in Pallra's home on Bajor in DS9: "Necessary Evil". 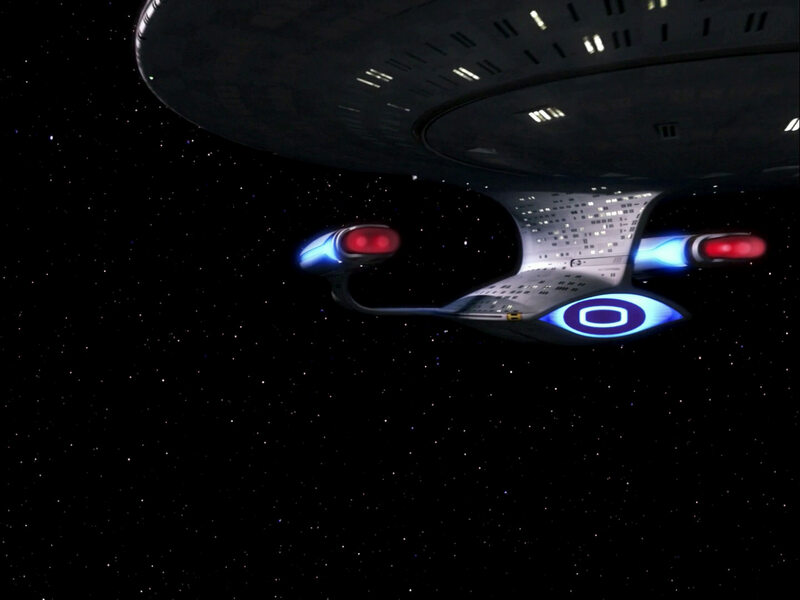 Evil" A better look at the bowl in HD. 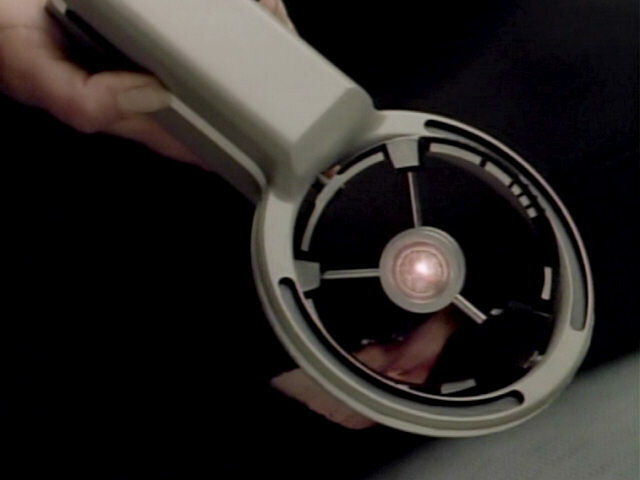 As can be seen, Eline's pendant is a miniaturized version of the Kataan probe. 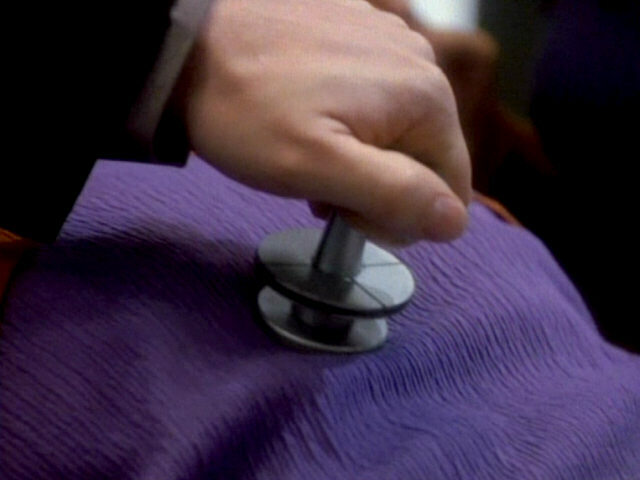 A close look at the pendant in HD. 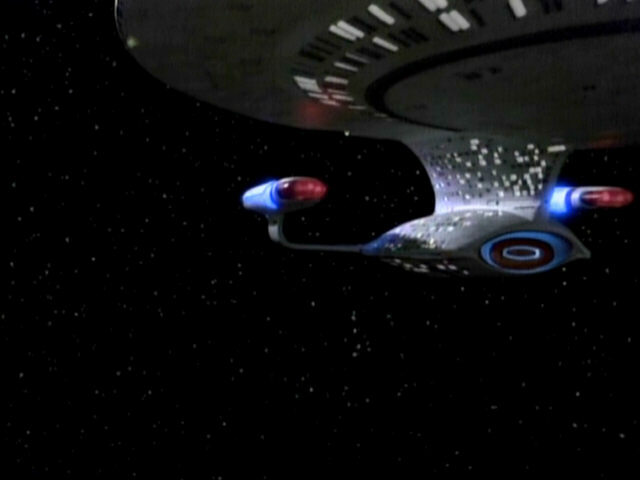 The USS Enterprise-D is waiting close to the Kataan probe. 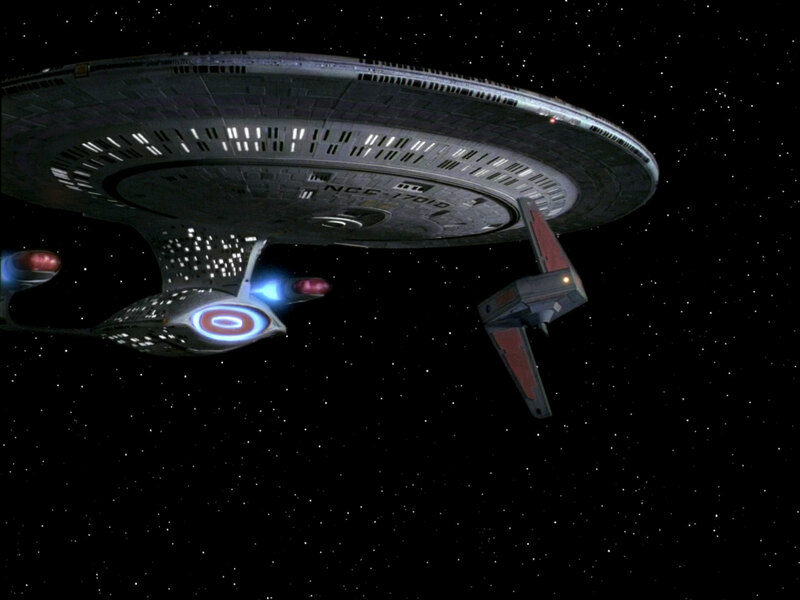 This is the only new shot of the Federation ship created for this episode. 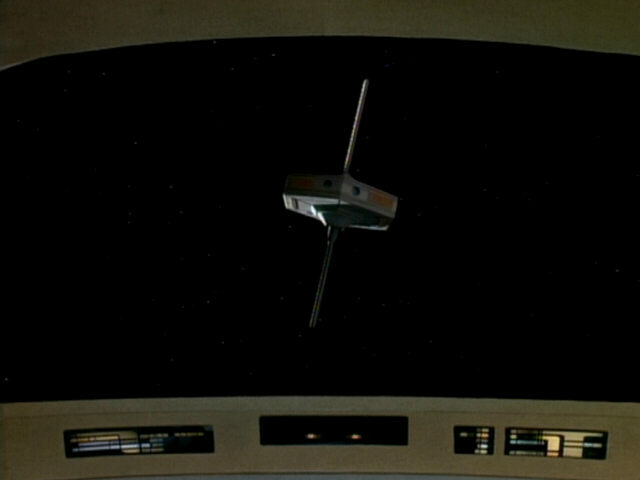 The probe in HD. 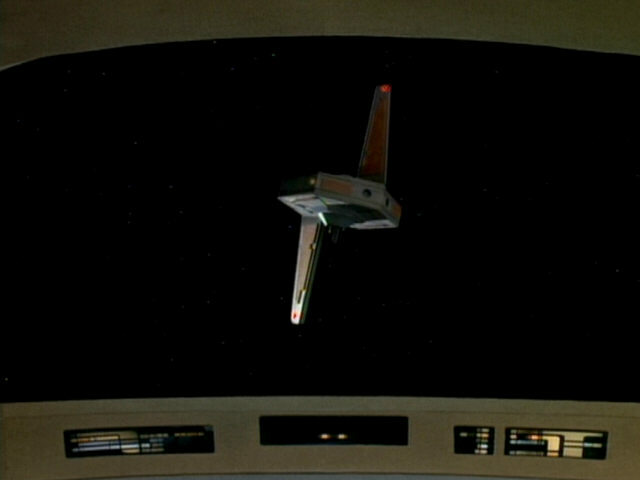 The Kataan probe is seen from some more angles on the viewscreen of the USS Enterprise-D.
An animated graphic of the Kataan probe is displayed at the engineering station in the aft section of the bridge. The probe looks much the same in HD. 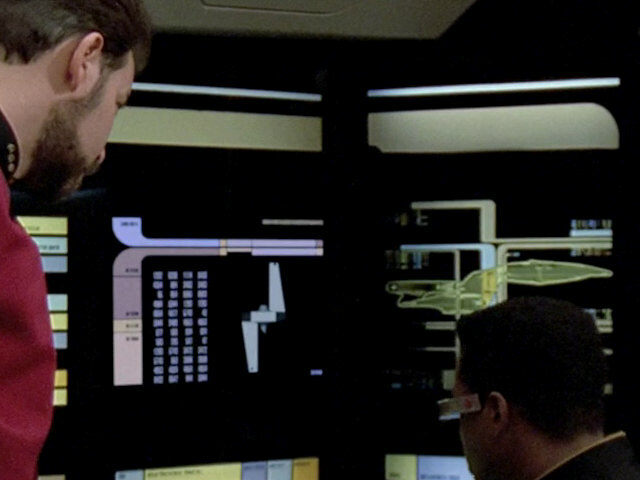 Troi's console can be seen in the bottom left-hand corner of the screenshot. 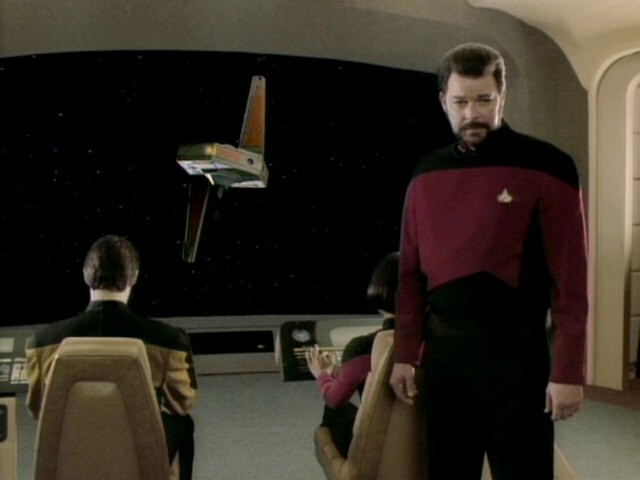 It now displays the same graphic Riker's console has displayed ever since "New Ground". 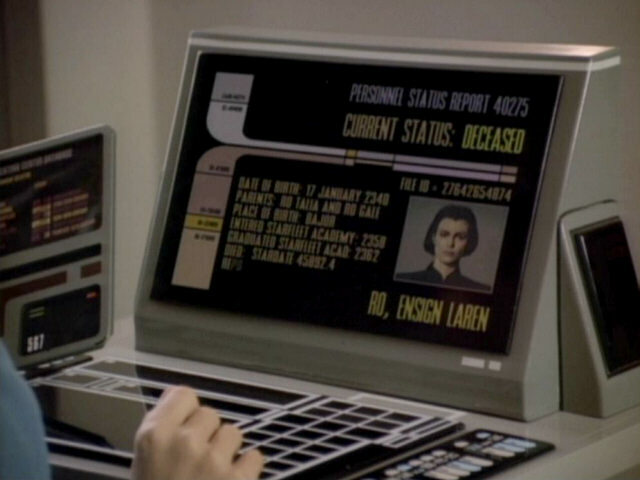 In "The First Duty", Troi's console still displayed the old graphic it had featured since the beginning of the show. "The First Duty" A better look at the medical devices in HD. 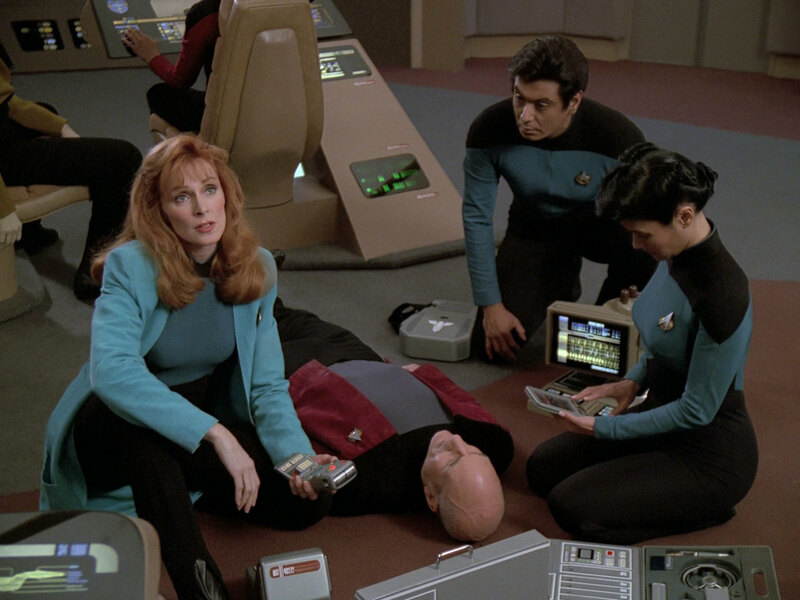 Both Crusher's old and new medical case can be seen in this screenshot. 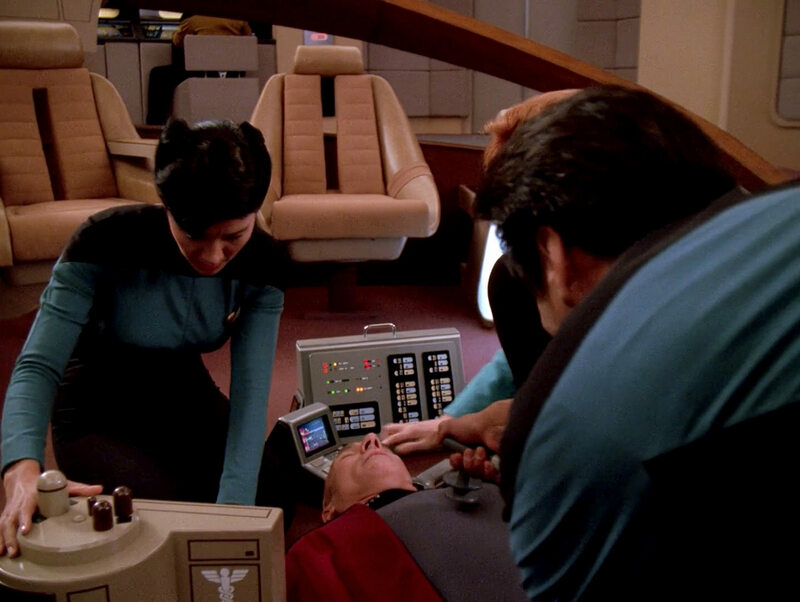 The medical console behind Nurse Ogawa is also normally seen in sickbay. 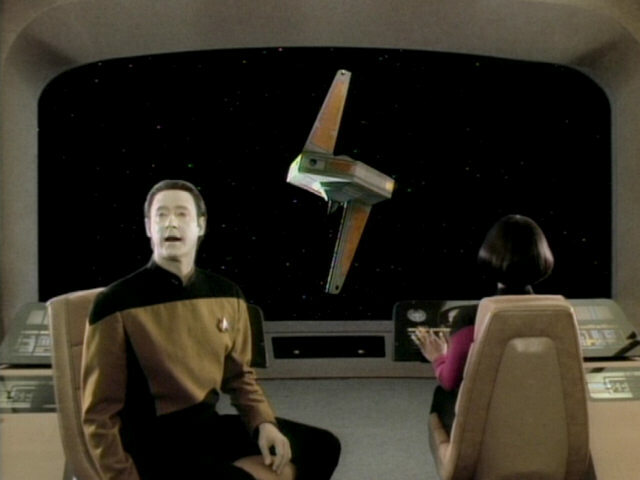 It was last seen up close in the season 4 episode "Data's Day". 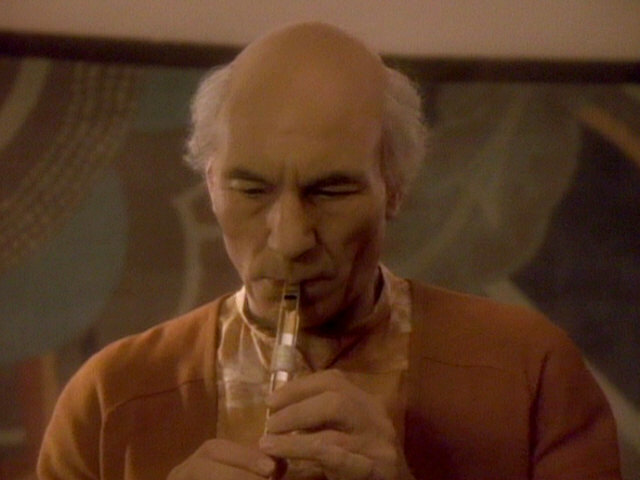 A good look at the Ressikan flute. 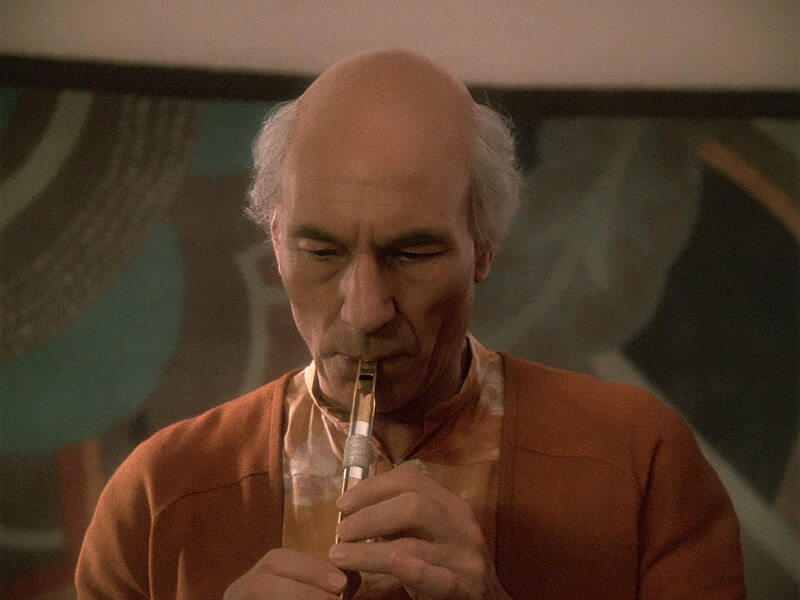 The flute in HD. 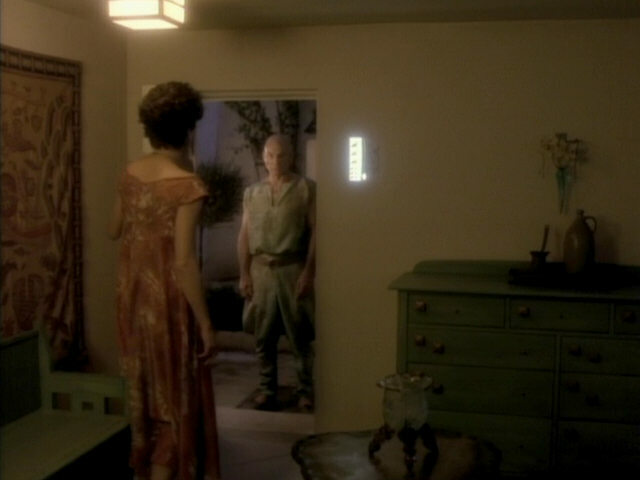 The decorative wall relief consisting of tiles was seen in Kamin's house was originally seen on Ramatis III in "Loud as a Whisper". 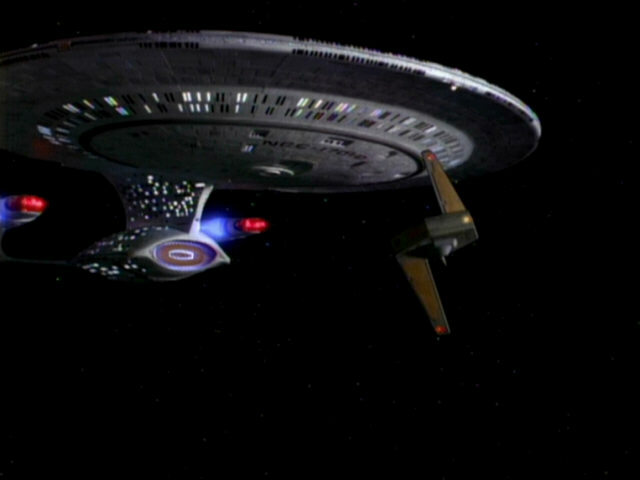 It appeared again on Angosia III in "The Hunted" and on Vulcan in "Gambit II". 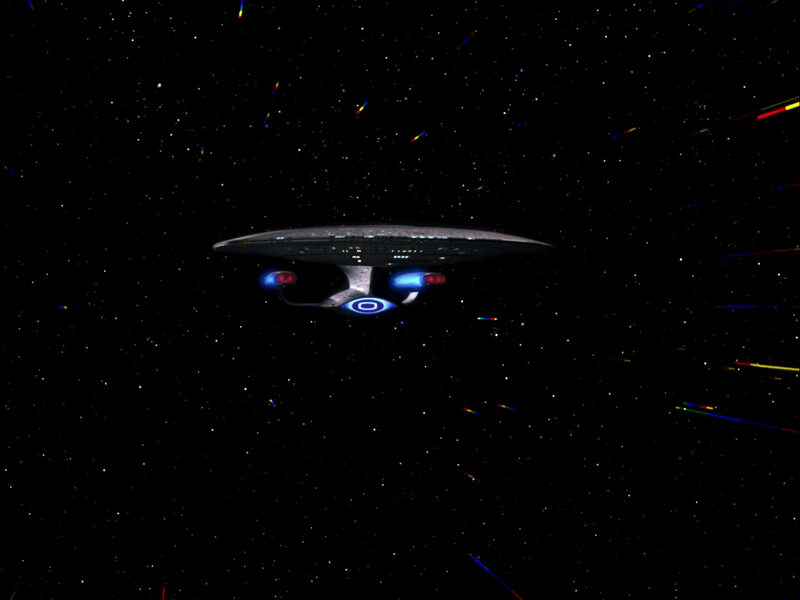 "The Hunted" The wall decoration in HD. 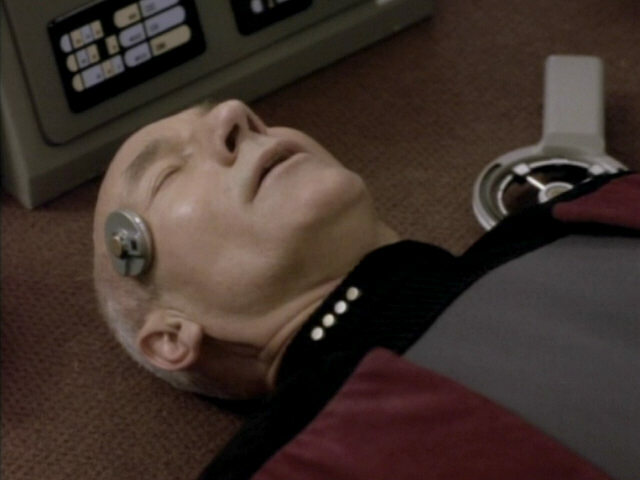 The medical scanner Crusher uses on Picard in this shot was previously seen in "Shades of Gray" and "I, Borg". 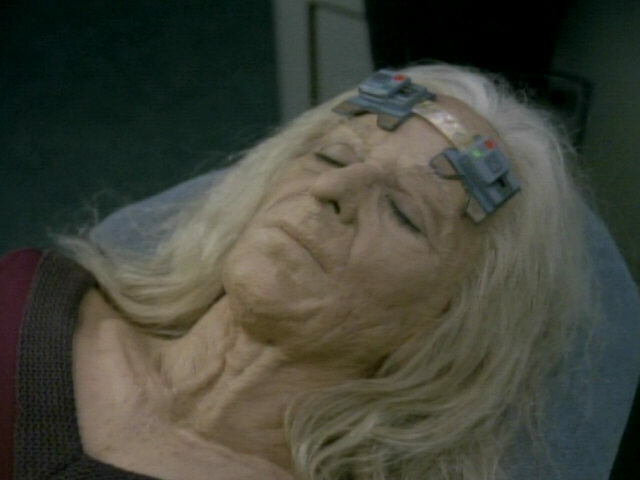 "I, Borg" The medical equipment in HD. 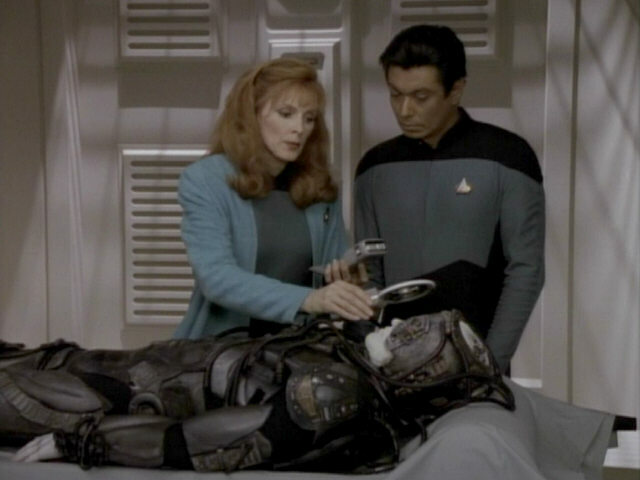 Crusher has brought some more medical equipment to the bridge. 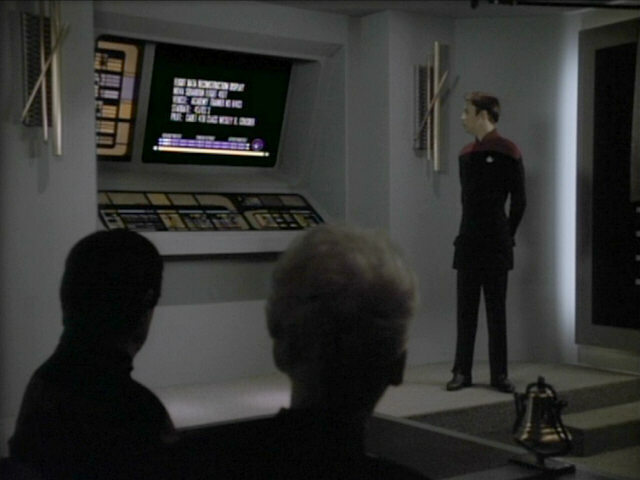 The console behind here was first seen in "Clues" where she used it to monitor the growth of Diomedian scarlet moss cultures. 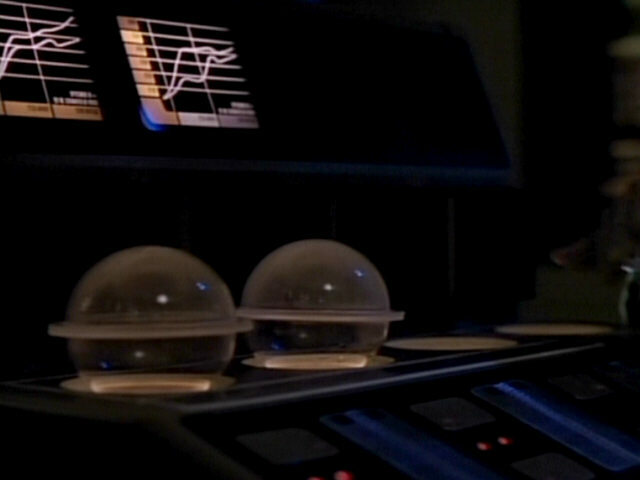 The console would later appear in sickbay in the background in several Voyager episodes, like "Phage" and "Parallax". 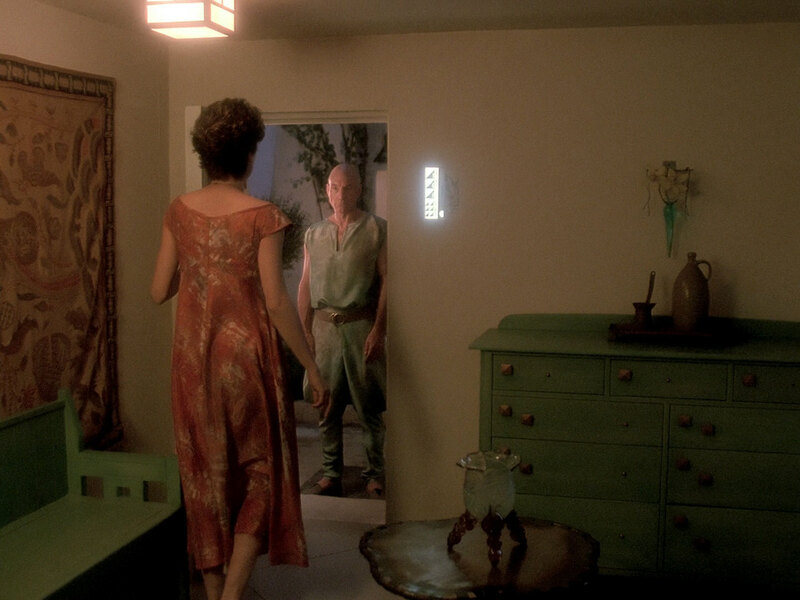 Filming equipment (and the shadow cast by it) can be the seen at the right side of this shot. The small problem persists in TNG-R. 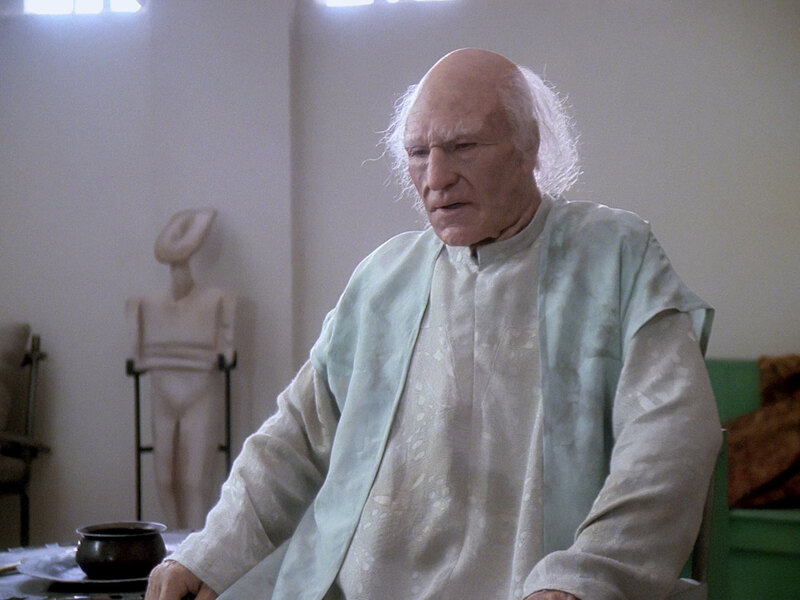 The large blinking medical console behind Picard was originally created as a monitor for Data's psychotropic stability test the android has to undergo in "The Schizoid Man". 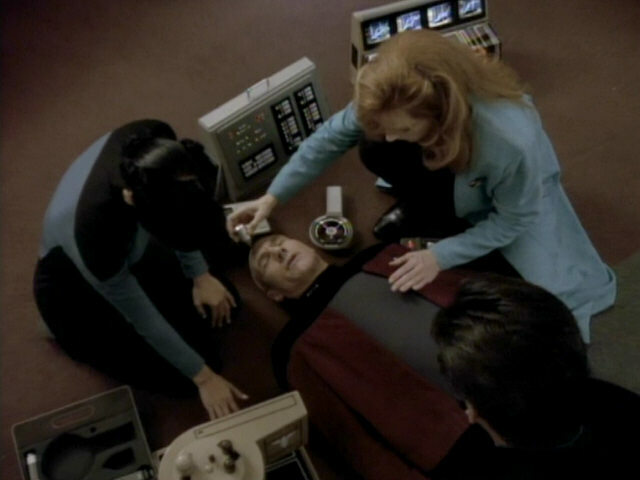 It later appeared in sickbay in several episodes. 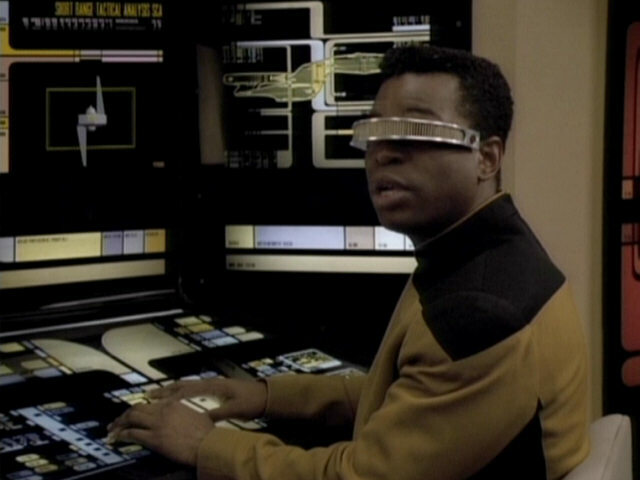 For this reuse, the front was covered with a plate with many blinking lights and a handle was added to the top of the console. 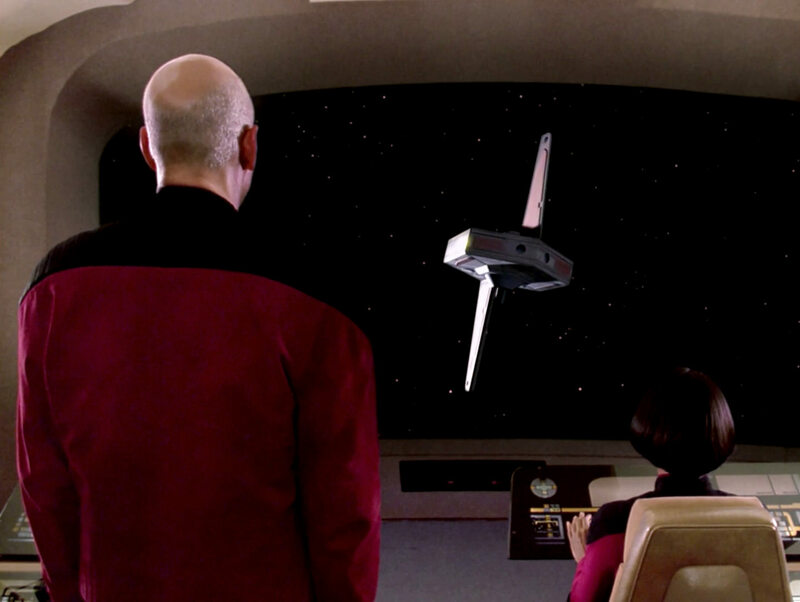 "The Next Phase" The monitor in HD. 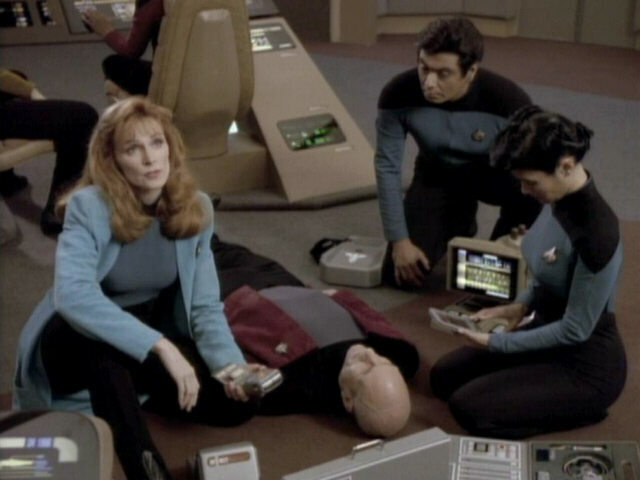 The cardiostimulator used by Nurse Martinez in this shot was previously seen as a medical scanner in "Future Imperfect". 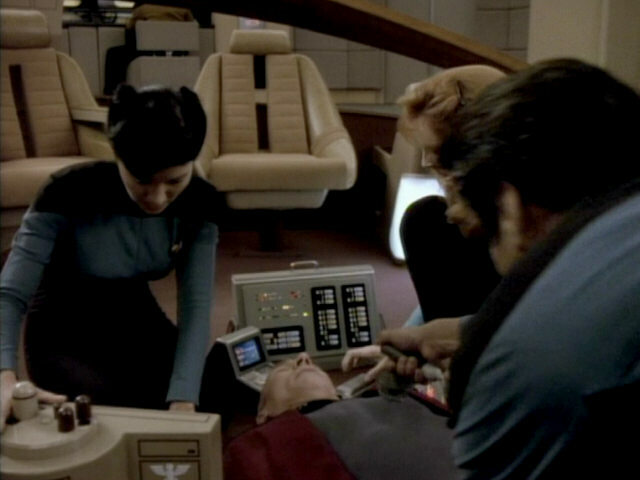 It appeared again as a cardiostimulator in the DS9 episode "The Wire" and was also seen aboard a Bajoran ship in "A Man Alone". 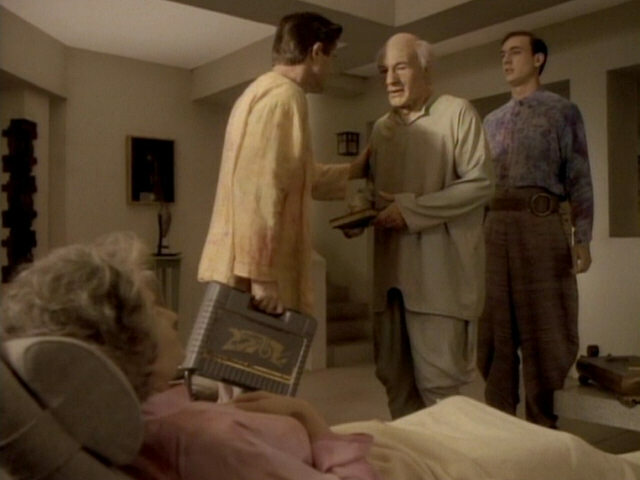 The cortical stimulators seen here are different from the one seen a few episodes earlier in "Ethics" and the rest of the series. 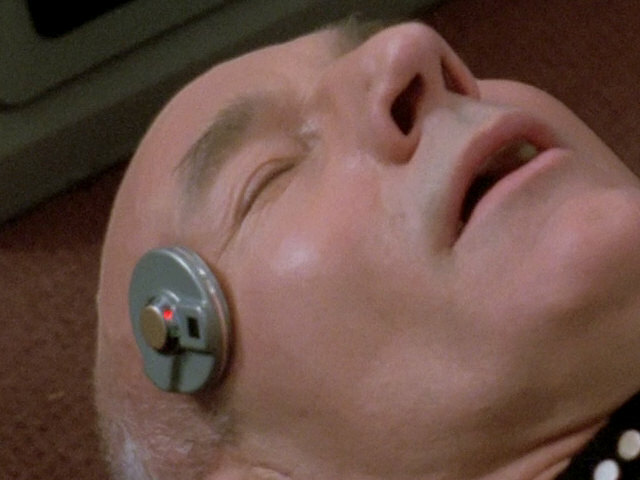 the People" The neural stimulator in HD. 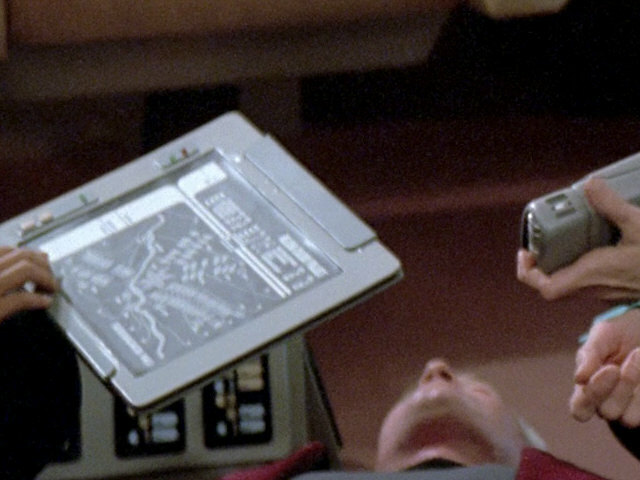 The large PADD seen here was originally created for "Silicon Avatar". 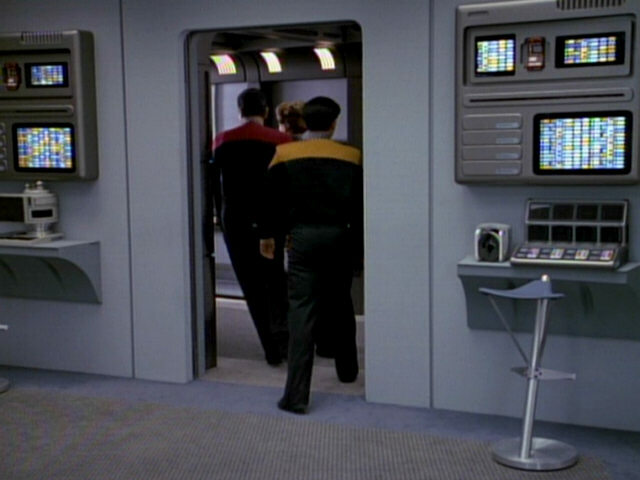 In that episode, only the back side of the PADD was seen, however. 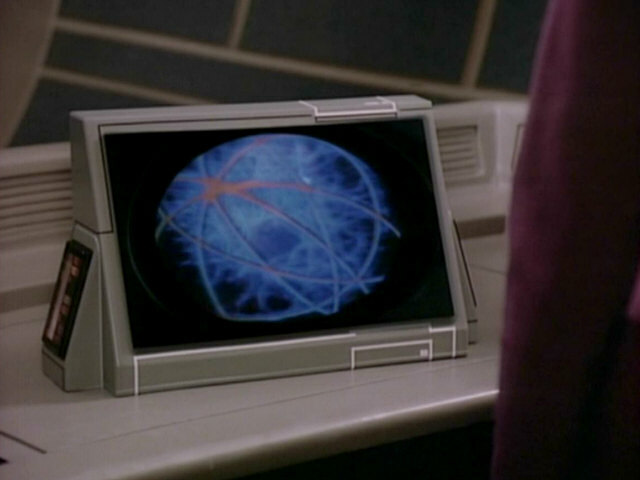 The PADD still displays a map of the colony on Melona IV, which was destroyed by the Crystalline Entity in that episode. 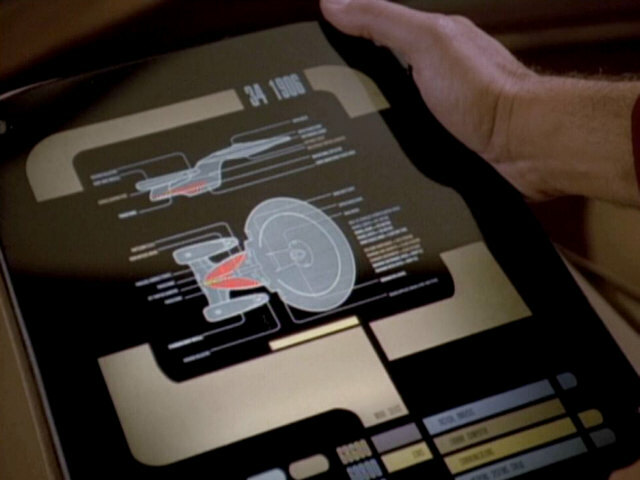 The same graphic appeared on a large transparent display in "Silicon Avatar". 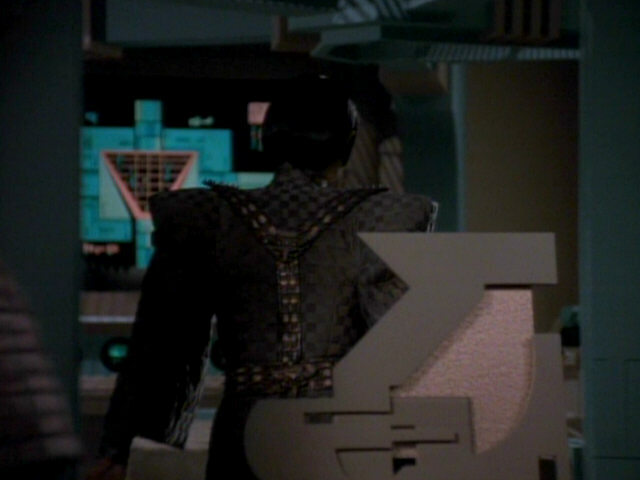 PADDs of this type were later re-used in "Year of Hell I+II" where they are in use by the Krenim. 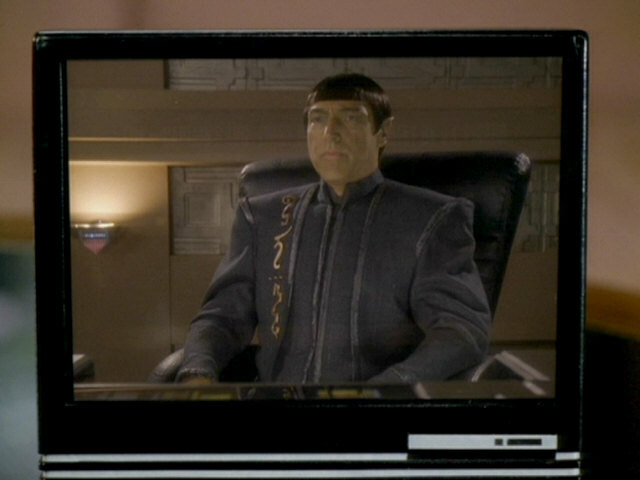 of Hell I" We can recognize more details on the PADD in HD. 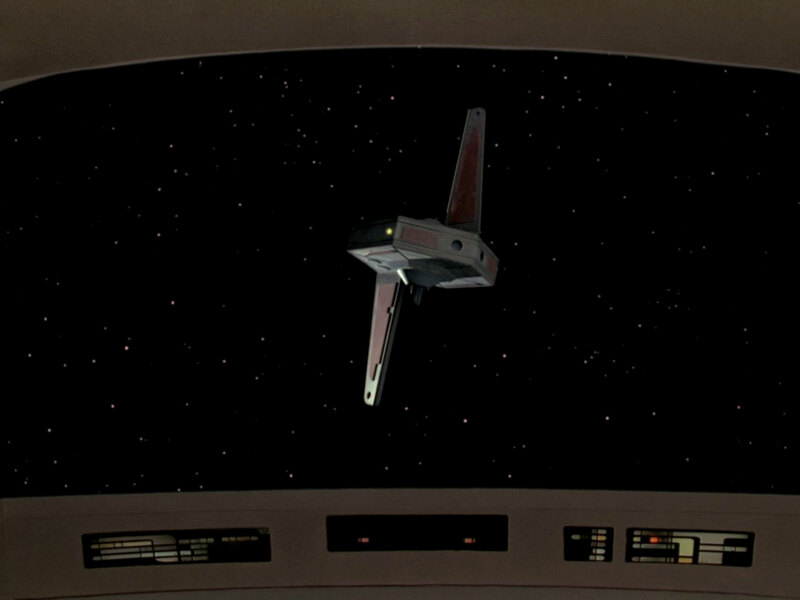 Another look at the Kataan probe. 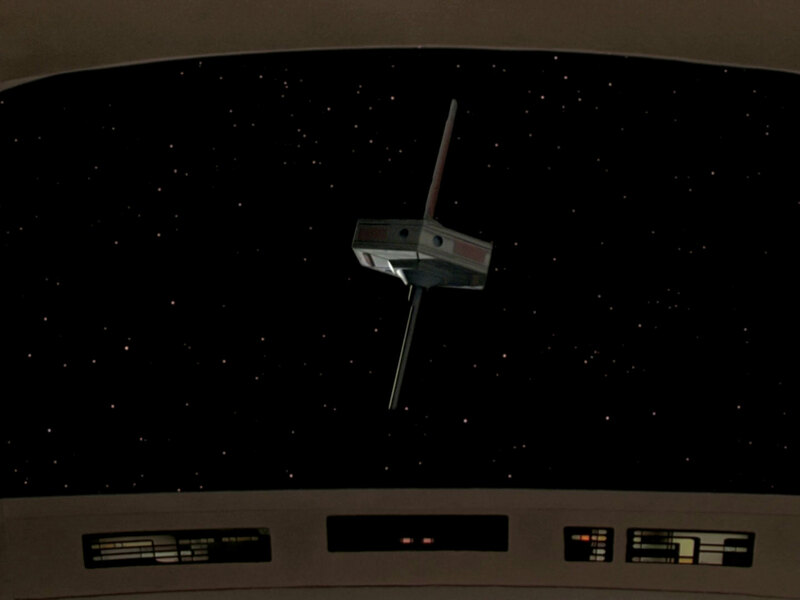 The probe in HD. 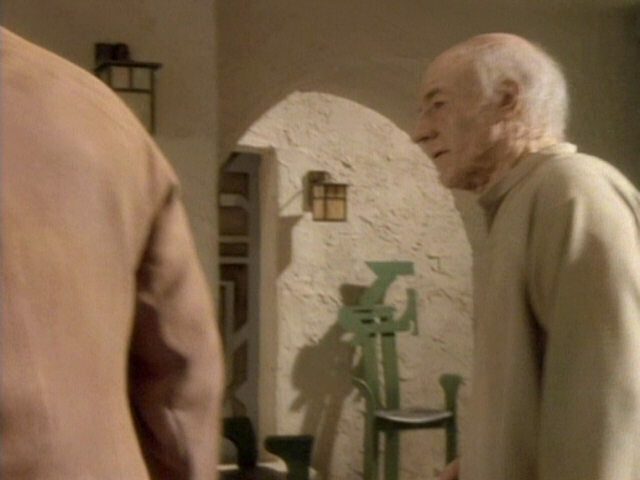 Chairs like the one in the background, with back rests evoking the written language used by the Ressikans, were later repainted and seen in use by the Romulan in "Face of the Enemy" and by the colonist of Dorvan V in "Journey's End". 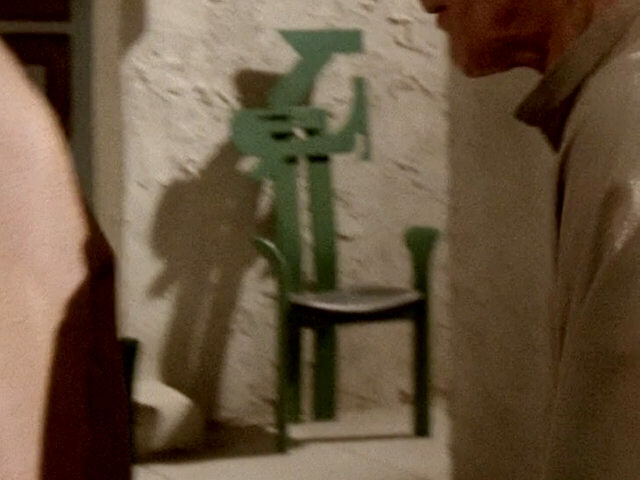 "Journey's End" An HD close-up of the chair. 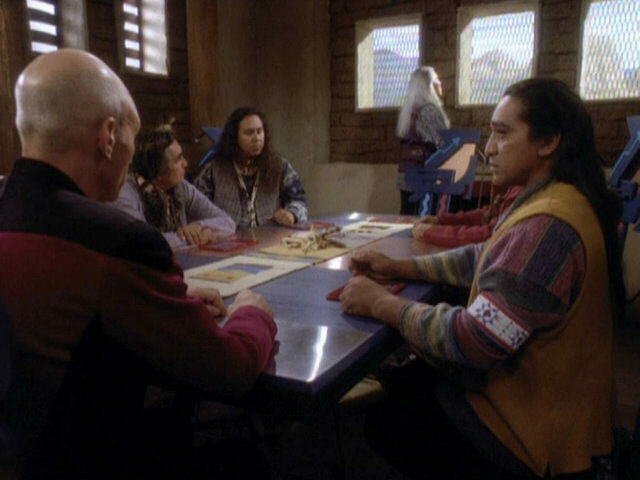 The medical case seen in this shot featured the aforementioned Ressikan writing. 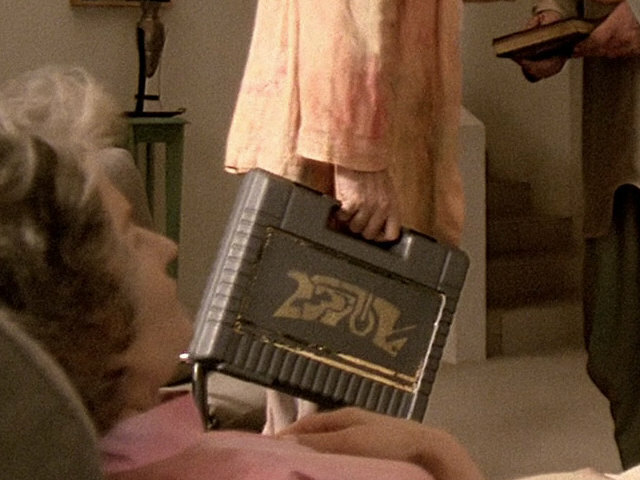 An HD close-up of the case. 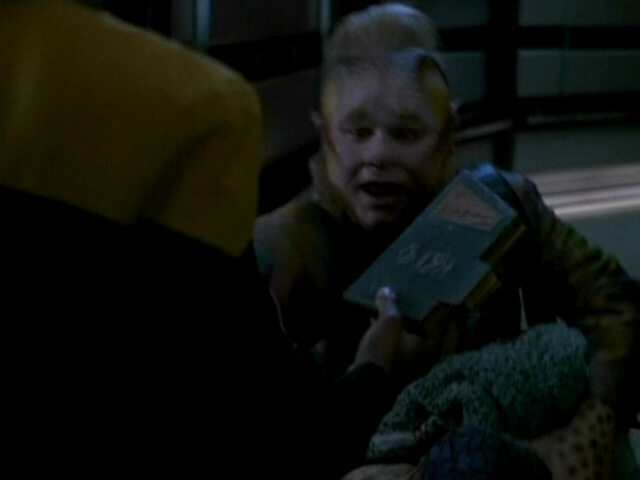 Kamin's book turned up many years later in the Voyager episode "Demon" as the "Selected Works of Jirex". 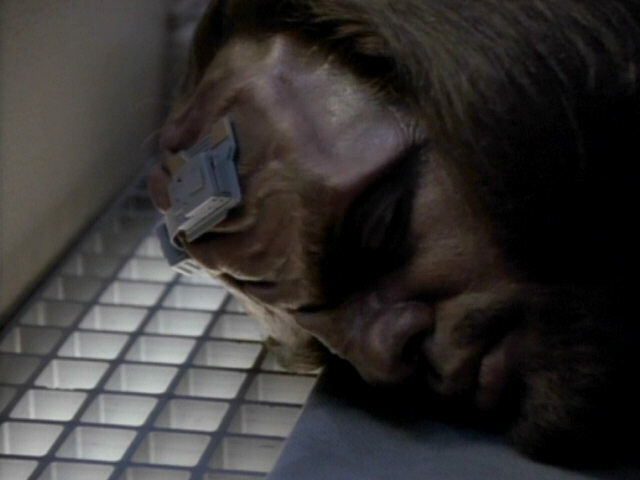 VOY: "Demon" An HD close-up of the book. 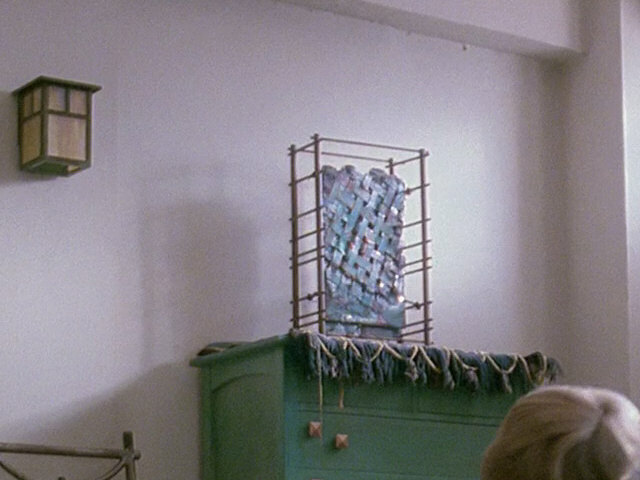 The piece of art on the chest of drawers (again featuring the strangely arranged knobs) first appeared in the living room of the Duras family house in "Redemption I+II". 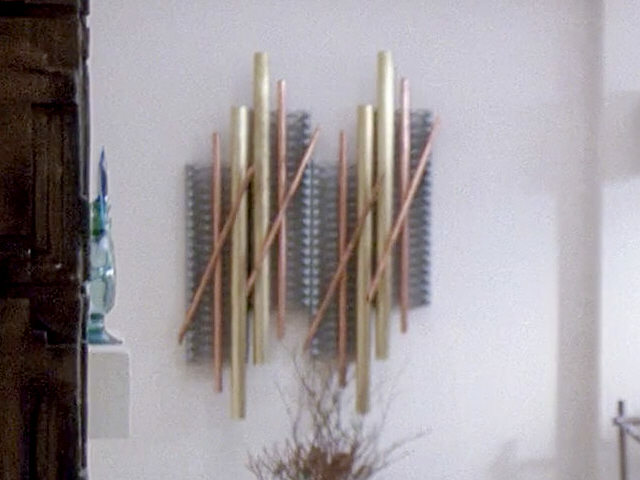 It was turned upside down for this re-use. 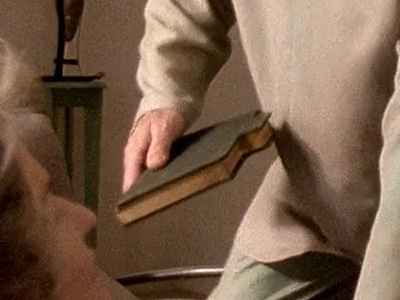 "Redemption I" HD close-ups of the works of art. 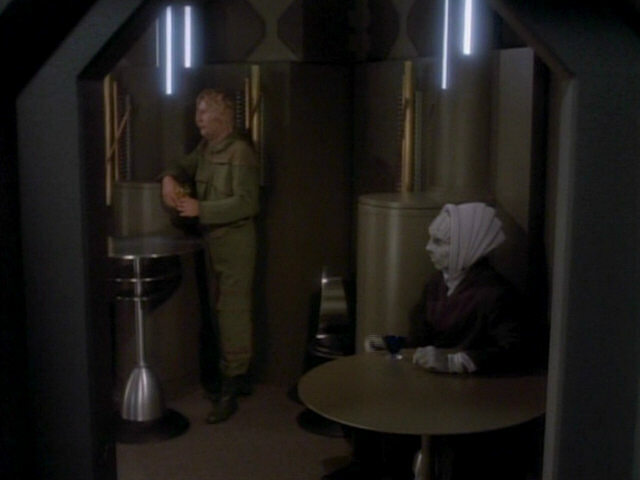 Kamin's house features two statues of humanoid figures. 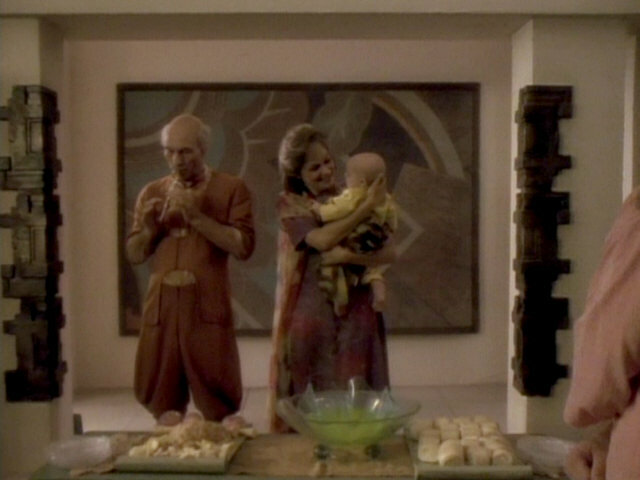 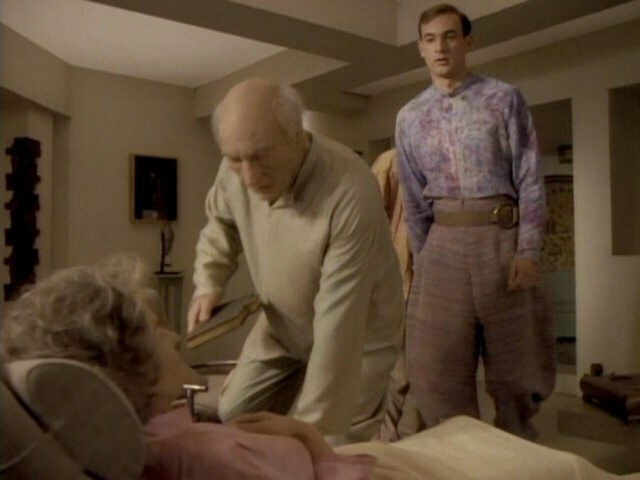 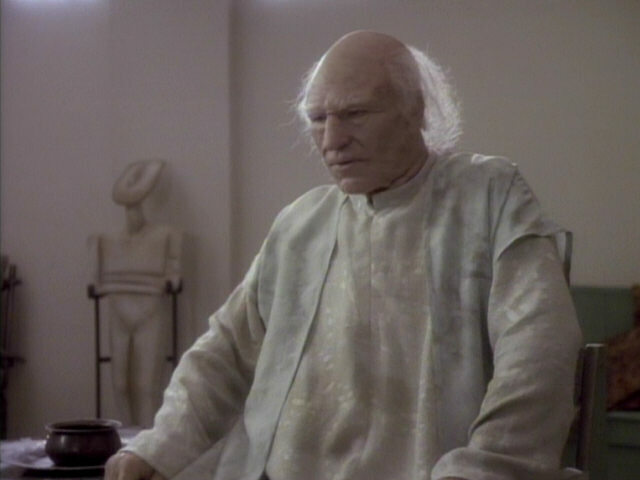 One of the statues later turns up again in the Voyager episode "Time and Again". 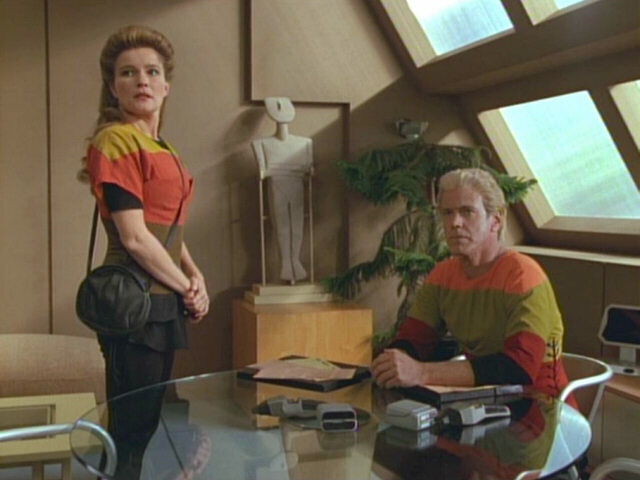 The metallic wall decoration seen in the background was first seen in the hearing room at Starfleet Academy in "The First Duty". 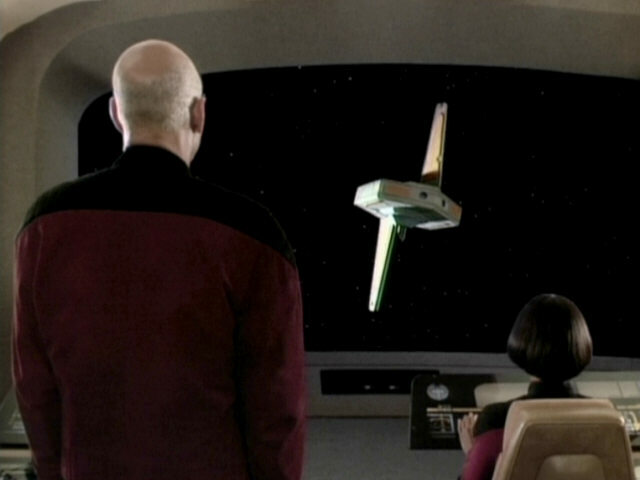 The wall art was re-used in several later episodes, including "Chain of Command I", where it was seen in a bar on Torman V.
The Kataan probe is launched from a site close to the village of Ressik. 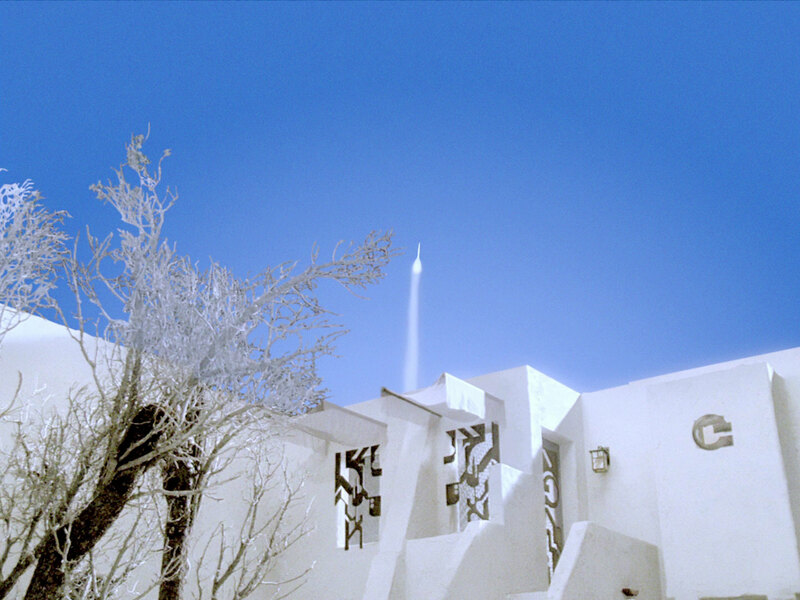 The reconstructed launch in HD. 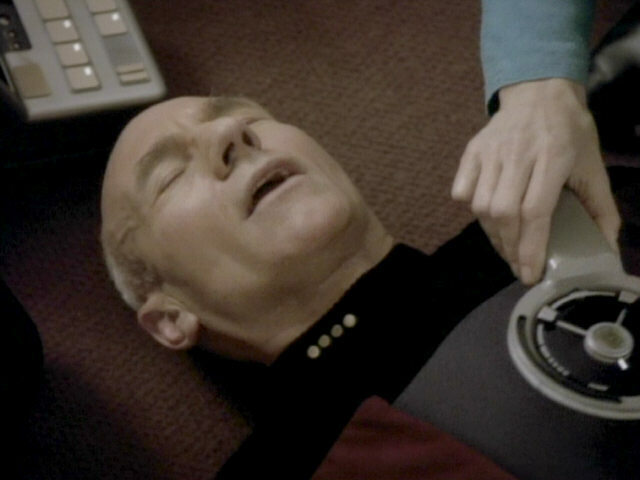 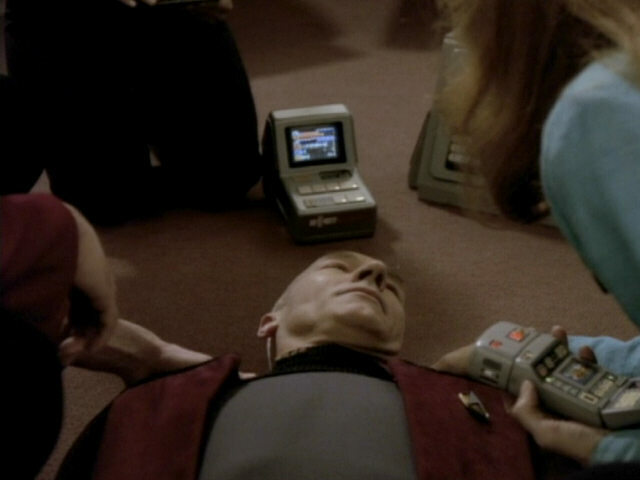 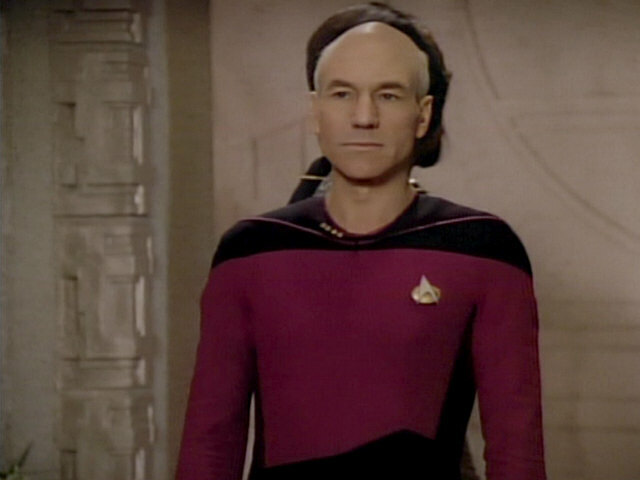 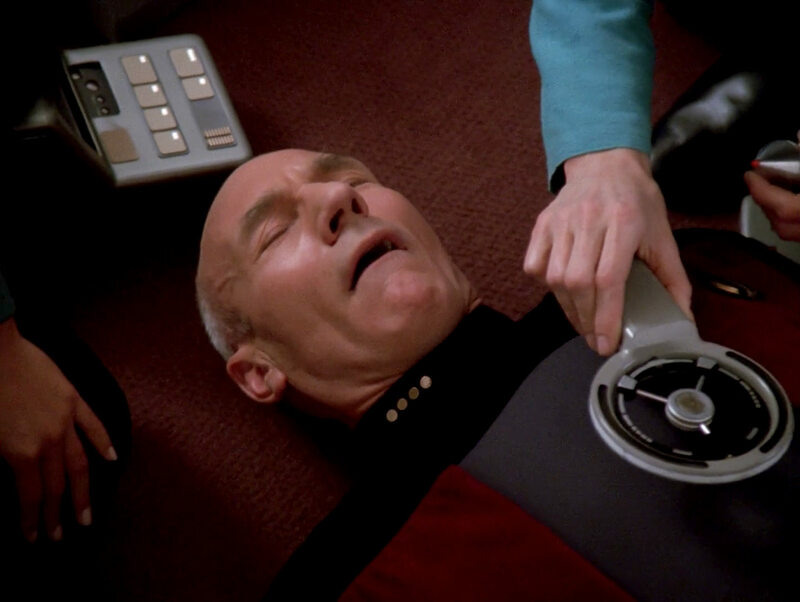 A small new medical console is seen behind Picard. 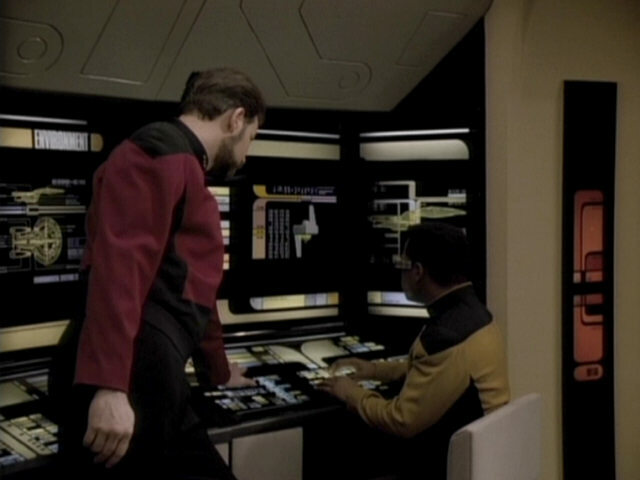 This console features a small monitor which displays the Captain's medical data. 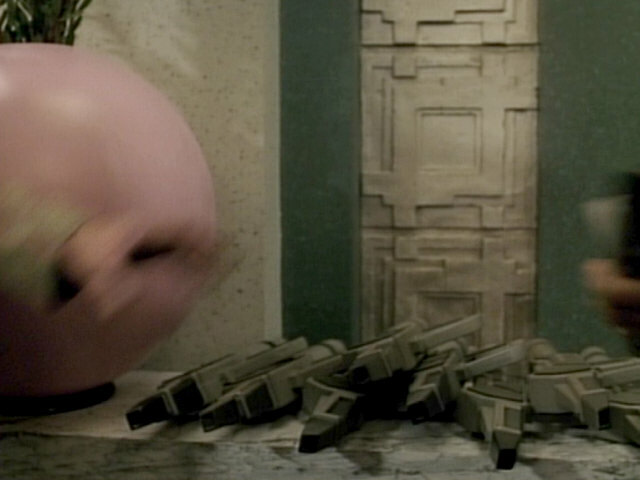 This animation was not added in post production but was displayed by the prop live on set. 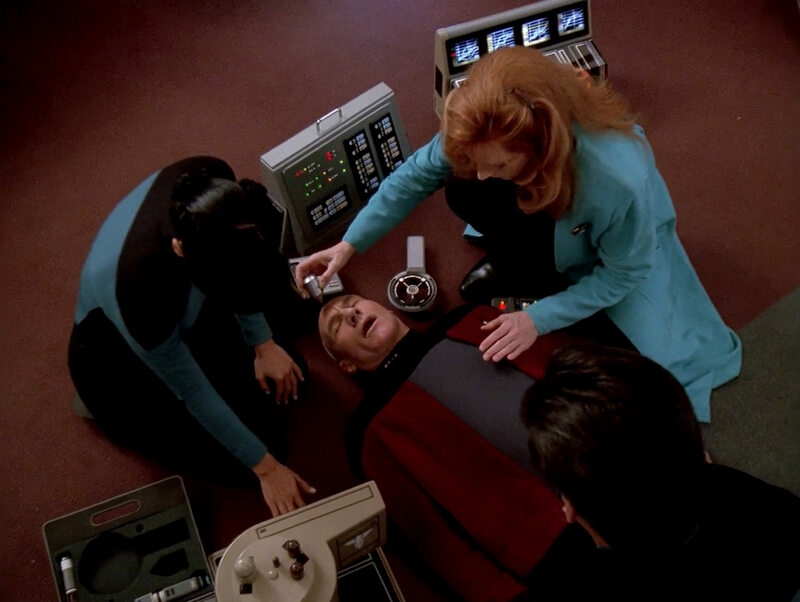 The medical equipment in HD. 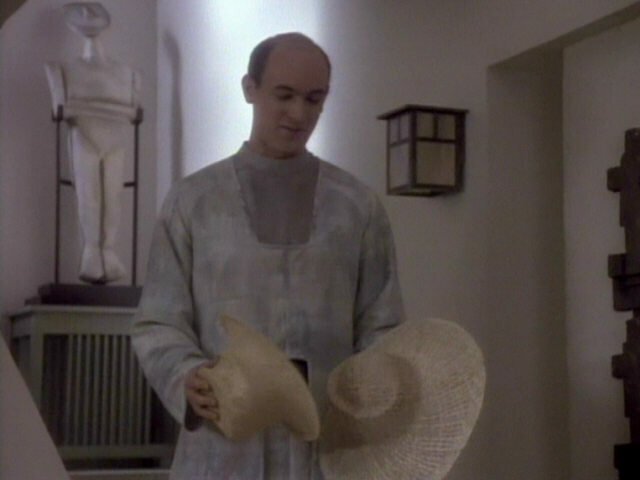 Thanks to Andrea Wiels for the hint about Picard's hat.